How do I even begin to summarize my time in Zambia a couple weeks ago? Patience's story is just one of many, and she represents the dozens and dozens of women in our program who have risen above oppression to choose a better life for themselves and their families. Her story is still being written, as she's a current student in our Kaunda Square location. She will graduate this coming March. During our recent trip to Zambia we asked who would want to share their story with our CiH family in America, and Patience was eager to do so. I took that same truth to the situation of the gunshots that one night. I knew I wouldn’t be able to rest easy and be restored in that house if I stayed there. And I needed to be my best self if I wanted the best for the ladies. I hear them coming closer on the other side of the concrete wall that’s about eight feet high. My bedroom window is only two feet from the wall. I lay perfectly still, as if that’ll keep them away. Heart pounding, sweating, tears falling out of my eyes without my awareness of them. We learned that we could eat dinner for less than $1 if we bought day-old scones at the grocery store and dipped them in our jar of peanut butter. We learned that Coca-Cola is cheaper than water, but probably won’t make you feel good if it’s all you drink. We learned how to say hello, how are you, and see you tomorrow in Nyanja. And we also learned that we could really get on each other’s nerves. Mark and I just look at each other and utilize our nonverbal sibling communication skills. He’s squirming, I’m squirming. Please just let us type this five-page document to get us out of here sometime today. But we trust, we let him do his thing, and meanwhile I’m going weak in the knees as the day heats up and the cow tongue smell becomes especially pungent in this dark, cramped, busy market stall. Mark and I say few words to each other. We’re just soaking it up. It’s not my first time here, but it’s still a lot to take in. And yet somewhere in the midst of all the hustle and bustle and new sights, it has this strange feeling of home. There are plenty of instances of suffering and misfortunes in the Ng’ombe Compound in which we work, but friends, this isn’t one of them. Emeli, a woman in her fifties, is helping to run an international nonprofit. Emeli doesn’t have a college degree or even speak English. Emeli has only ever made fritters. But given the wings, Emeli will fly. Not could or might or should be able to. We hope each of you have had a joyful and HOPE-filled start to 2016. We are so excited to share the results of our year-end campaign soon, but first we wanted to share this story. And if you’re new to our CiH family, welcome! As many of you know, one of our ladies, Esther, was in a tragic accident a couple months back, resulting in the death of her husband and two of their children. Esther is part of the House of Moses Orphanage partnership class, identified as vulnerable to having her children taken away if her and her husband couldn’t find a way to earn an income. This vulnerable identification was placed on them from the Zambian government before the accident. Imagine the past couple of months that Esther has faced. Not only did she bury her baby and first born child, but she also attended the funeral of her husband, housed all out-of-town relatives for months, lost her primary income source (her husband), and struggled to survive. After we shared her difficult story, you all stepped up, big time. You donated almost $1,000 to cover her immediate expenses of food, soap, child’s school fees, etc. And together with the community of our CiH classes, Esther and her remaining child have survived. They have been comforted, encouraged, uplifted. They have felt great pain, but they have also experienced great hope through the women surrounding her who have spent hours praying with her, cooking for her, cleaning her entire home. We expected Esther to be out of class for weeks, months, potentially a year, until she could get herself out of bed and re-join the group. But just THIS WEEK, the start of a new year and her graduation year, Esther walked back through our doors. Still tender, still hurt, but walking forward, stepping into community, and making progress in her healing process. We are so proud of Esther. We are so overjoyed to have her back at our Chikondi Community Center. Esther thanks each one of you who have played a part in her story of rising from the ashes. It’s just the beginning, but she is so very thankful. And also just as exciting, Esther is looking forward to the future now. She is dreaming of ways to care for her child, not out of desperation but out of pride and hope. With your contributions made in 2015, we are able to provide Esther with a seed for her to launch her own business, a long-term solution to her immediate needs. Esther will receive a sewing machine and materials, an opportunity given to her by you. A rare occurrence in our programming, but a bright solution to a tragedy in our family. 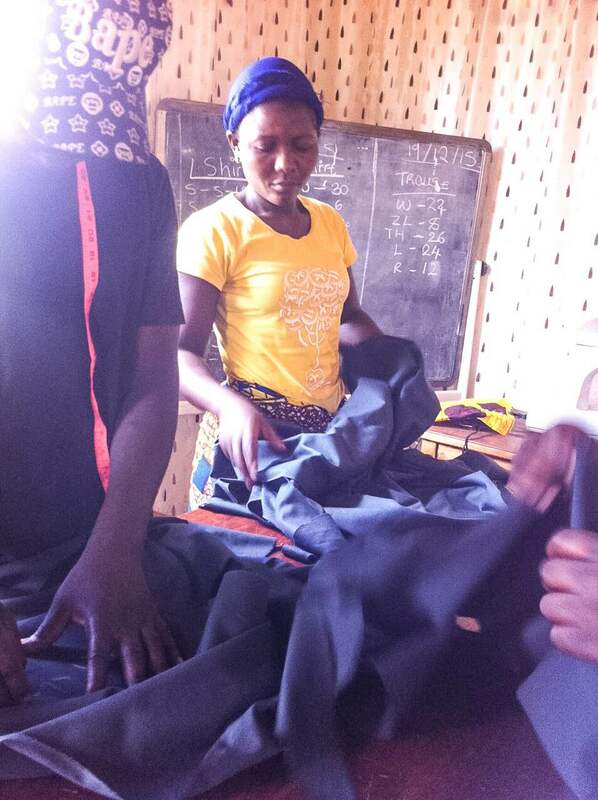 Esther will graduate this March, and she has already started working on her final examination sewing projects. She will start sewing and selling curtains as her business, and she is so excited about it. We are, too! For a woman to grasp a long-term solution rooted in education and independence, especially coming out of such a dark situation, is incredible. Her forward thinking and desire for dignifying work is such an encouragement to us, and I hope it is to you also, as Esther paves a new way for women in Zambia. Esther’s story has touched more lives than we thought possible. And she’s just one woman in our program. Thank you for being a part of a movement so impactful in the lives of so many. Friends, this post is hard to type and will be hard to read. But please join us in the valleys as you’ve joined us on the mountaintops. Yesterday tragedy struck our Clothed in Hope family. One of the women in our program, Esther, lost 2 children in a road accident. Rose is 45 years old, a mother of two children, and part of the newest graduating class from our Chikondi Community Center training program in Zambia. On Saturday, September 12, our entire CiH family gathered together at our center for a most joyful graduation day as we celebrated our largest graduating classes yet, a total of 8 women! Rather than recap all of the details that just don’t do the day justice in how incredible it was, I wanted to share the day through one story- Rose’s story. The storm that destroyed the facility couldn’t destroy the passion and determination with the Muchochoma Village ladies and our training staff. When life gave them lemons, they made skirts. They made skirts sitting on maize sacks on the ground in the sunshine. The most beautiful skirts from the most inspiring determination. This is Anastasia's Story of HOPE. Because of your contributions and purchases that make it possible for her to complete our skills training program in Zambia, she is empowered and equipped to pave a new path for her family. Thank you for joining us in breaking the cycle of poverty, one stitch at a time.